LAST FALL, THE POP IDOL LADY GAGA wore an evening dress made entirely of meat to the MTV Video Music Awards. This attracted a lot of attention. “What was she thinking?” many people asked. “Is there a deep symbolism here that we are not parsing?” Lady Gaga would later say that it was in protest of Don’t Ask, Don’t Tell — a sentiment that, while earnest, didn’t make much sense. Meatpaper was puzzled in a different way. “Where did she get that meat dress?” we wondered. “Where do meat dresses come from, anyway?” And then we found just the gentleman to answer our questions. Franc Fernandez is the guy who sewed Lady Gaga’s meat dress. He is also an artist and designer based in Los Angeles. He obligingly spoke to Meatpaper about the nitty gritty of creating bespoke meat couture. Gaga was going to present at the Video Music Awards. It was the first time that she would be at a show like that and not doing a performance — so she needed an outfit that would be a performance. Her stylist, Nicola Formachetti, gave me a ring and said he wanted a meat purse. So how do you research a meat dress? I went to my family butcher. You have a family butcher? I said what we were doing, and he said what cuts to use. 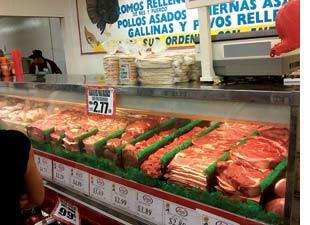 At first I was going to use carne asada meat — the cheapest. But that’s too bloody, which means it would brown really fast. So my butcher told me to use — I’m not sure what it is in English. It’s called matambre. I bought all the matambre that he had — about 40 pounds. I sprinkled salt on it to get the last of the liquid out of it, but it was a greasy meat, so there wasn’t much to drain. And then I picked out the cuts that looked best for the front, and me and my assistant Lyndsea kind of draped it on the mannequin. How did you sew it together? We used a corset as the base, and used a strong nylon thread to stitch everything together. If you’re making something out of meat, there’s only so much — you may have a plan, but the materials are given to you. You conform to the law of the material. We wanted it to look like a dress, not a freak show. And it turns out that from far away, most people thought it was a dress, and then when they got closer they saw that it was meat. We’ve gotta ask — what sequence of events leads someone to a job like yours? When I was younger, I went to a bit of architecture school, a bit of art school and a bit of design school, and never finished anything because I would get bored. But there was a club in Los Angeles called Mustache Mondays, where the kids would prepare all week for what they were going to wear that night. I started putting architectural models on my head and wearing them there. And stores began to notice and magazines began to notice. And then I was doing this for a living. The way that I work is to just go with the flow. How do you make meat a comfortable thing to wear? Or is such a thing impossible? What’s funny is that she told me that it was the most comfortable dress, compared to what she usually wears. It was essentially just a corset that was hugging her. So did you have to cut her out of it at the end of the night? I don’t know how she got out of it. When she left at the end of the night, she was still wearing it. I don’t think she was completely sewn in. How do you store a meat dress? After I bought the meat, it was in and out of the fridge for two days. There was sewing it and then and putting it away. The night she wore it, it smelled good. It smelled like meat! Gaga said it smelled good. Then after she wore it, it was out of the fridge for a few days. When I saw it again, it didn’t smell, but it was starting to turn gray. I was trying to decide what to do with it. Freeze it. 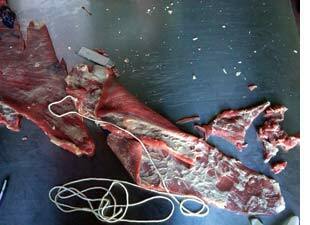 Make jerky. Anything but throw it away. I don’t consider myself an artist, but I thought of the Canadian artist who wore a dress made of meat and then let it decay in the museum. I liked that ­— a dress that changes over time. I thought of Damien Hirst, letting a cow’s head decay so that every time you saw it, it was a different sculpture — one day you’d be there and the eye socket would be filled with maggots, another time something else. But it’s not my dress. It’s hers. It was about asking. do with it. Freeze it. Make jerky. Anything but throw it away.The dress is being preserved right now — like it’s going to be taxidermied and embalmed. I found an amazing taxidermy artist. He does things for natural history museums where they need something more than just a stuffed animal — like where the lions are jumping or the deer are drinking out of the water. The way taxidermy works is that you take all the bio out so that it won’t decay anymore, which means that you essentially take out all the blood. So the dress is completely gray now. But he’s going to add the color back in. Did making a dress out of 40 pounds of beef change the way that you felt about meat? I’m Argentinean. Even when I told my family, they said, “That’s great.” It was never weird for me or odd. I just put it up on my blog and watched it all roll in: the compliments and the death threats. I still get the death threats to this day. Gaga wore the meat dress onto the Ellen show, and Ellen gave Gaga a bikini made out of vegetables, because Ellen is a vegan. And not long ago, I met the girl who made the vegetable bikini in a bar. You might think they’re not good, but L.A. is a small town. HEATHER SMITH is a contributor to the book Infinite City: A San Francisco Atlas. She covers science, art, culture, shootings, stabbings, various small fires, and shouting matches at public meetings for the news service Mission Loc@l. She remains enmeshed in writing a book about humans, insects, and the various misunderstandings that arise between them. She is also a Meatpaper editor. This article originally appeared in Meatpaper Issue Fourteen. • Dining for the Brave: Italian Futurists take to the kitchen. • Why Is This Meat Different from All Other Meats?